Tiles (segments of double-helix DNA with sticky-ends) may be "programmed" by selecting different sticky-ends. 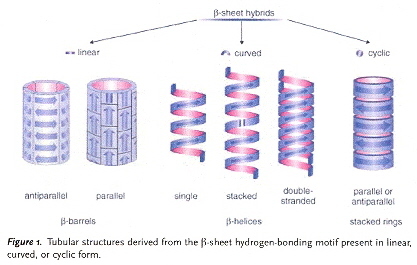 It was observed that the "sheets" of (2-dimensional) DNA could fold over into nanotubes. It is interesting that a shape grammar can be used in this work. This paper discusses how 1-, 2- and (especially) 3-dimensional self-assembling structures can be designed (using sticky end selection in different associations)a. 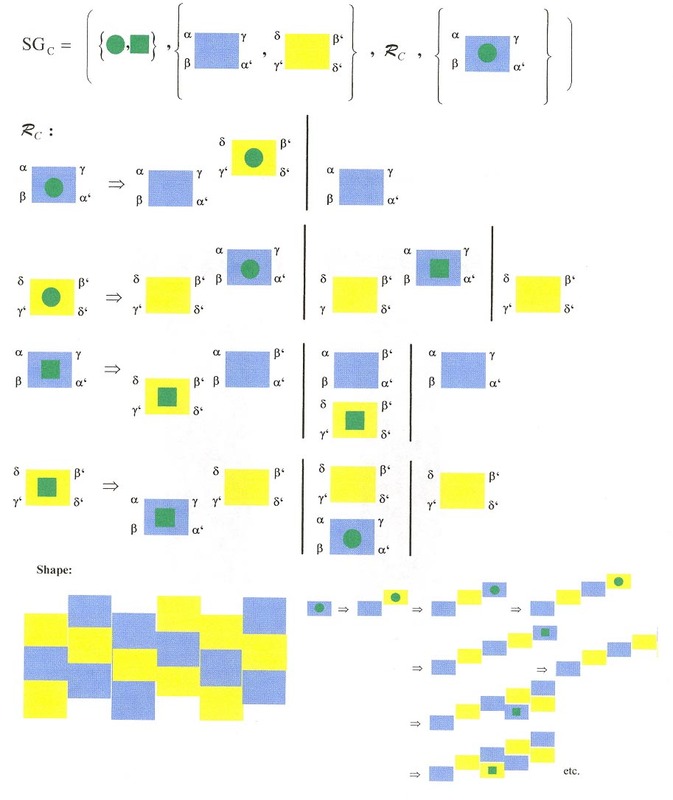 The desired associations are seen in Table 1, and for 3-dimensional structures, the associations are given in Figures B through F.
Shape grammars could be developed for all three dimensions, but they will not be done here. Double-double crossover (DDX) composed of four dsDNA helices, each adjacent dsDNA strand joined by a pair of sticky-ends (for a total of 6 sticky-end connections - see the "arrows" in the first figure below) is described in this paper. Planar structures are observed experimentally, but self-assembly into three-dimensional structures is also possible. A shape grammar for 3-D structures is provided. This grammar assembles DDX structures in "on-end" (vertical) rod-like form, but can also be viewd as planar sheets in 3D form. Nanostructures containing short DNA duplexes as arms with transition metal vertexes as centers are formed. Specifically-addressable transition metals support properties such as luminescence and redox (oxidation and reduction). 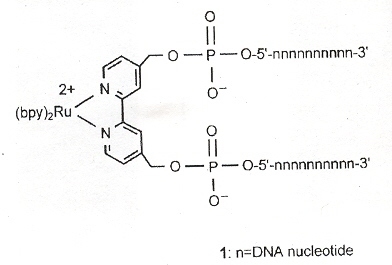 Specifically, ruthenium (II)–DNA forms a rigid complex with two DNA strands as seen below. These complexes self-assemble into cyclic bipyridine/double-stranded DNA structure. 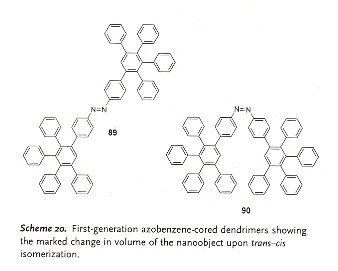 Applications of DNA and RNA to nanotechnology similar to those discussed in the Appendix (Shape Grammars) in "Emergent Computation: Emphasizing Bioinformatics". 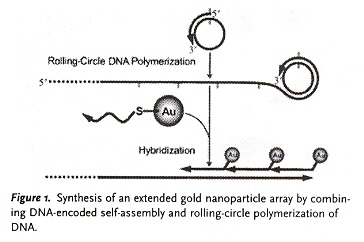 The authors construct a combined mixture of Gold nanoparticles (AuNPs) with DNA 1 (AuDNA1). These mixes of AuNPS/AuDNA1 are then polymerized using rolling-circle polymerization to form large one-dimensional arrays of AuNP. Guainine deposited under ultraclean conditions on inert Au(111) substrate will self-assemble (with hydrogen bonding) into G-quartets (even in the absence of the DNA backbone as well as the absence of metal ions in solution). 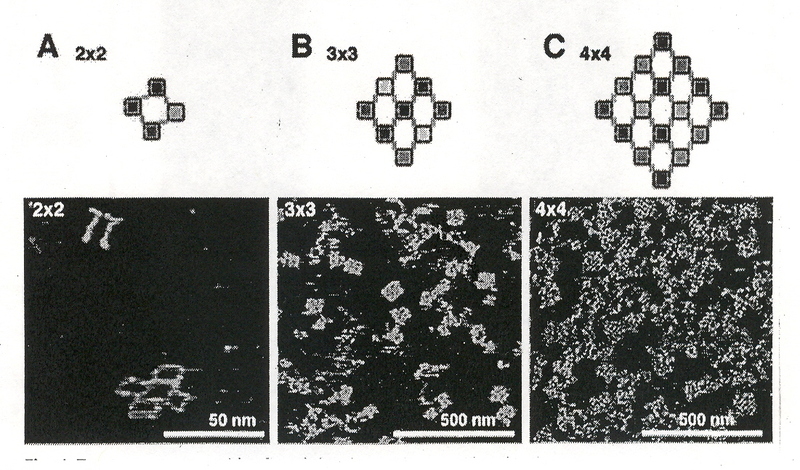 Using Scanning Tunnelling Microscopy (STM), each unit cell is composed of four G islands. This phenomenon is favored by kinetics rather than by thermodynamics. Quantum Mechanical (QM) methods such as Hartree-Fock and Discrete Fourier Transforms (DFT) confirm a quadruplex structure. In particular, the quartet structure is about twice as strong as they are with the dimer, this extra bonding force being referred to as Resonance-Assisted Hydrogen Bonding or (RAHB). The intermolecular hydrogen-bonding with RAHB stabilization supports the observed blocks of two-dimensional self-assembled structures. A two-dimensional shape grammar is thus possible. Controlled transitions between a G-quadruplex structure folded and (compact) and its linear dsDNA form (as proven by FRET UV emissions) supports the construction of a nanomachine. Transition from the linear dsDNA to the quadruplex form in the presence of either Na+ or K+ is controlled by using "C-fuel" or "G-fuel" (producing dsDNA GC duplex waste products). A 21-base d(GGGTTA)3 oligonucleotide is used with fluorescence ("F") at the 5' end, and tetramethylrhodamine ("T") at the 3' end forming F21T. For example, 3'–d(CCCAAT)3–5' is 21C "fuel", similarly for "G-Fuel". The distances between the ends of the two forms: linear dsDNA and the G-quadruplex cause a difference in UV emission. Cycling efficiency decreases as the waste product concentration increases. Eleven successive cycles have been achieved. The oscillation distances between the closed G-quadruplex and the open conformations have been calculted, as well as the precise force generated. Applications of DNA to nanotechnology. Dimerization of RL RNA molecules where L refers to a tetraloop (of bases) and R refers to a tetraloop (of bases) receptor. 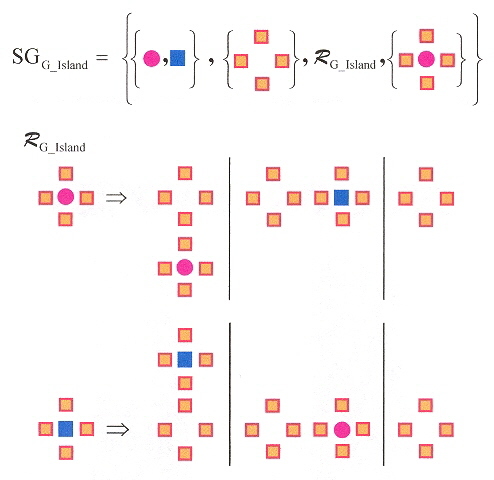 Associations of LL with RR, then RRLL RNA linear self-assembling macromolecules. These are more than theoretical, as actual GAAA and GUAA tetraloop RNAs were found to be self-assembling. 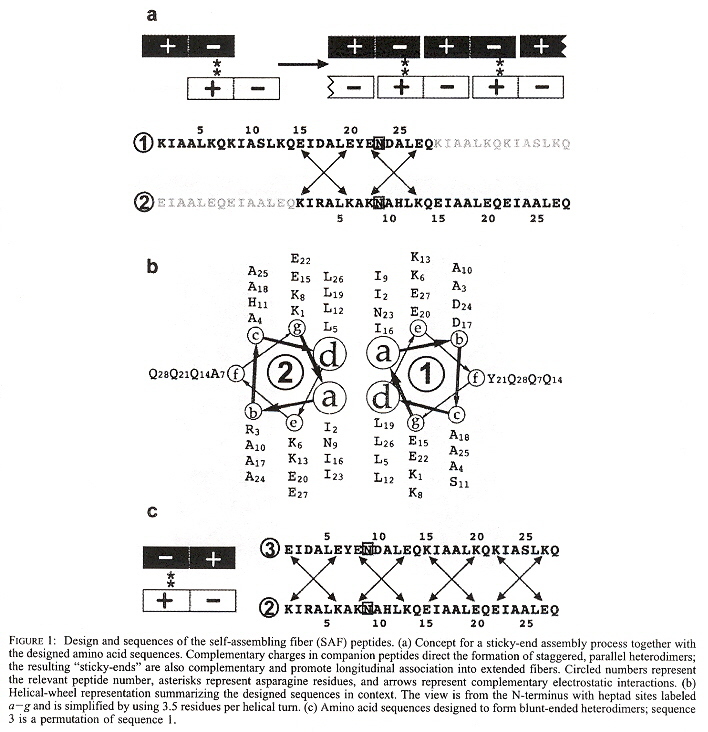 Identical RNA subunits that the authors call "tectoRNA" can assemble into squares (se Fig. 1 A). 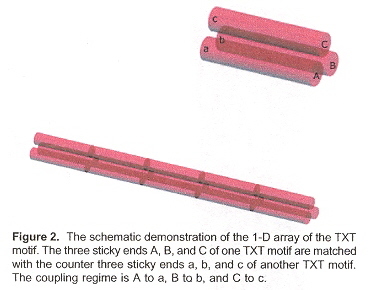 With sticky ends, five types of tectosquares are possible (see Fig. 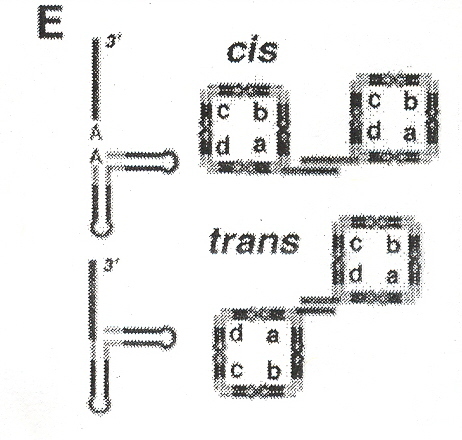 1 F), which can assemble into cis or trans configurations (see Fig. 1 E). 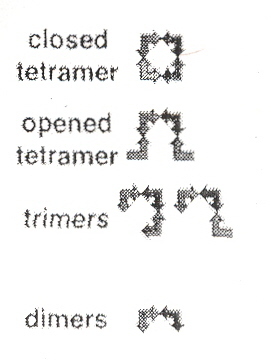 Dimers, trimers, open tetramers, and closed tetramers can occur (see Fig. 2 A). 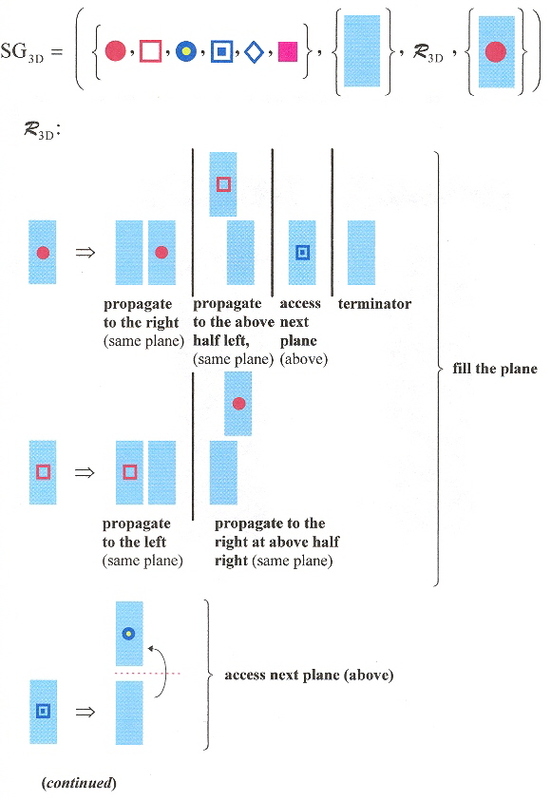 As discussed in the Appendix to "Emergent Computation: Emphasizing Bioinformatics", shape grammars can be used to describe this process. Fig. 3 A, and Fig. 4 A show some experimental results found. Such materials can be useful in nanotechnology, and this is discussed in the following paper. Using an electric field, rapid (less than 100 ms.), reversible DNA switching indicated by red and green fluorescence is described. DNA templating to create discrete, three-branched metal nanostructures as precursors for three-terminal nanoelectronic devices. Three oligonucleotides that self-assemble using sticky-ends. The core is a ssDNA region hybridized with a biotinylated oligonucleotide that can be tagged with streptavidin. These were then metalized with copper as well as silver. Two DNA molecules are viewed as devices "PX" and "JX2" with two states each. 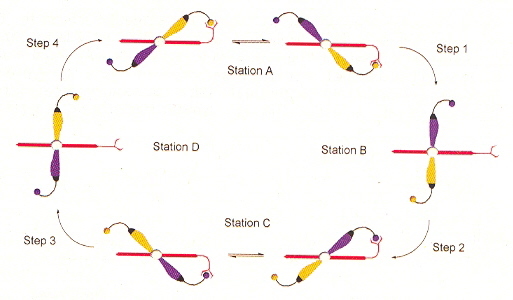 These devices are sequence dependent. The specific application is the positional control of polymer concatenation. Thus four ligated molecules are produced (below). This device could be used as a finite-state device. DNA tweezers are programmed. However, what is most interesting is how these tweezers are controlled. Genetic regulation of nano-tweezers is envisioned. The regulation protein LexA of the SOS regulon gene of E. coli, and the regulation protein LacI of the lac operon of E. coli are used to control the DNA tweezers in an artificial gene. Pharmaceuticals often fail to be of value due to problems with solubility. 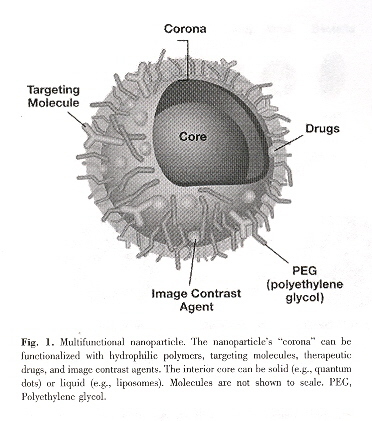 By chemically modifying the surfaces of nano-liposomes (core holds pharmaceuticals) with polyethylene glycol (PEG), called "pegylation", pharmaceuticals become encapsulated, effectively becoming soluble. Surface ligands convert these nanomaterials into biosensors, fluorescent tags, imaging agents, etc. (see Fig. 1). Due to their nanosizes, nanodevices can transit through blood vessels, cross the blood-brain barrier, stomach epithelium, avoid spleen filtration, avoid liver fenestrae and Kupffer sieve filtration. Charged particles can be located on dendrimers. 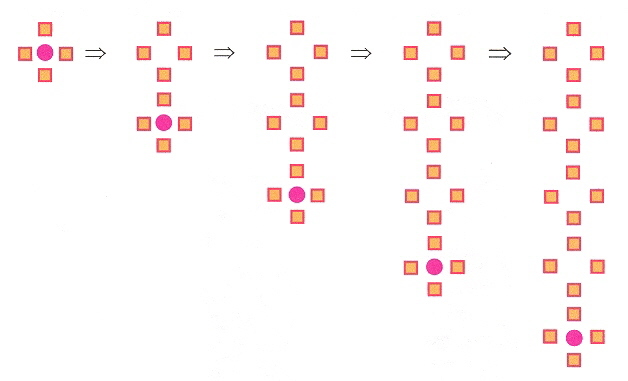 As another example, silica-coated lipid micelles containing luteinizing hormone-release hormone (LH-RH) as a targetting agent can deliver ferric oxide quantum dots to LH-RH receptor positive cancer cells, and then after imaging, a rapidly oscillating magnetic field causes these dots to acts as projectiles and selectively kill only the cancer cells. This is a study concerned with the interaction of plasmid DNA with three kinds of functionalized Carbon nanotubes, the goal being to create a vector for plasmid DNA. Viral gene vectors can be immunogenic. These functionalized carbon nanotubes are soluble, and plasmid pCMV-βgal were allowed to form complexes, tests were made at different concentrations of plasmid. Flourescent assays as well agarose gel electrophoresis show that functionalized carbon nanotubes can be used as plasmid DNA (especially, ssDNA) vectors. The multifunctional envelope-type nano device (MEND) succeeds as a non-viral vector. It is composed of an inner core of plasmid DNA with polycations (stabilizing cationic polymers, in this case, poly-L-lysine), a lipid envelope, with ocyaarginine (R8) membrane penetrating peptide. Cellular uptake of these nano-particles is by macropinocytosis (macrophages internalize the particles into macropinosomes). Lysosomal degradation is avoided and thus high transfection is reported. Nanoparticles can be an environmental hazard. This paper discusses biodegradable monomethoxy (poly-ethelene-glycol)-poly(lactide-co-glycolide)-monomethoxy(poly-ethelene-glycol) or PELGE plasmid DNA (pDNA) containing nanoparticles. The recent non-viral vector composed of nanoparticles using poly(DL-lactide-co-glycolide) or PLGA and polylacide PLA were of interest due to their biodegradability as well as the ability to protect DNA from degradation. PELGE was found to be effective. Many diseases have associated blood viscosity changes. Molecular rotors with flourescent markers can be used to measure blood viscosity. Such nanodevices rotate around a C=C double bond. As the viscosity increases, the rotation is inhibited favouring flouresence. The relationship between viscosity η and flourescent quantum yield Φ is lnΦ = x·lnη + C, where x is a dye dependent factor, and C is temperature dependent. This equation can be rearranged into η = (κ·I)ν where I replaces Φ and κ∝10–C and ν = x–1. The sequence 5'–GGTTGG TGT GGTTGGT–3' can fold into a two-plane G-quadruplex that binds to α-thrombin protein. The basic function of this machine is as follows. 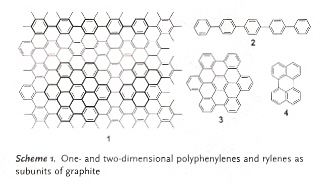 These materials can be thought of as subunits of graphene (a sheet of graphite). See Scheme 1. 3-dimensional Polyphenylenes are called dendrimers, used as nanomaterial structural elements. 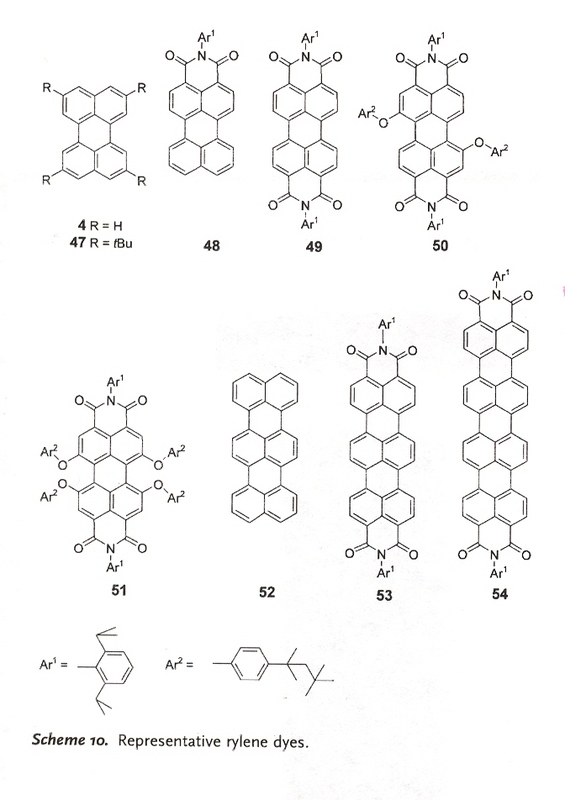 Rylene dyes include examples such as those in Scheme 10. Dendrimers are often used to deliver pharmaceuticals. Most dendrimers have flexible branches, easily deformed to bend back towards the center of the molecule. As a consequence, dendrimers are typically denser at the center as opposed to the periphery. Polyphenylene dendrimers are rigid, and they tend to be denser at the periphery as opposed to the center. Scheme 20 is an example of cis-trans isomerization that can be induced by light. 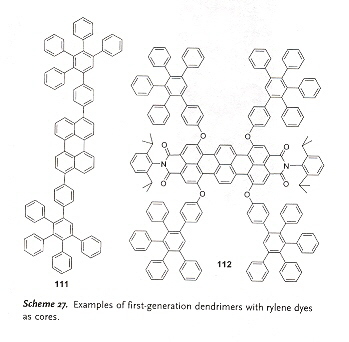 Rylene dyes may be attached to polyphenylene dendrimers in core positions, to result in emissive nanoparticles, see Scheme 27. 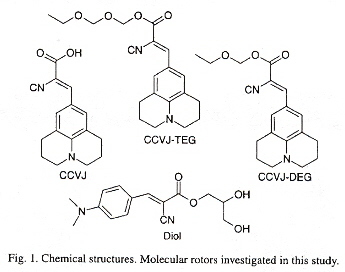 Alternatively, dendrimers with perylenemonoimide (PMI) chromophores (at the periphery) can be synthesized. Using Shape Grammars, languages can easily be constructed to generate various dendrimers. 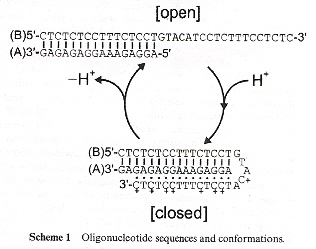 By controlling the pH, an oligonucleotide sequence can change (in a short time) between a open DNA duplex or a closed DNA triplex. Thus this is a new kind of nanomotor. This was observed experimentally using fluorescent spectrophotometry. Biological molecular motors such as flagella, muscles, cilia, etc. are expanded beyond rotary and linear motors to processive molecular motors which move across a surface. DNA based Kinesin, fueled by ATP, can "walk" along a microtubule, the direction being controlled. The "Shin-Pierce" walker can traverse a DNA track and return with full directional control. The "Tian & Mao" walker can traverse a circular track. The "Yan, Turberfield, Rief" walker also moves along a DNA track, but in a fashion similar to a "bucket brigade". where ki is the rate of stepping along track stator Si to Si+1 and ci(t) is the fraction of cargo occupied at stator Si at time "t". Chiral nanotechnology includes nanotechnology in which chirality plays a useful role. 'Nano-chiral technology' is distinguished from 'chiral nanotechnology'. Nanoscale approaches to chiral technology include asymmetric synthesis and catalysis, enantioseparation, analytical methods to assay enantiopure substances, and methods to determine configurations. Starting 'chiral pools' to create chiral products must be created. Molecular devices such as switches (including catenanes and rotaxanes as described on page 324 of "Emergent Computation: Emphasizing Bioinformatics") are described. Switches energized chemically or photo-driven. Molecular 360° rotary motors are described as are self-assembling nanotubes. Chiral Fullerenes composed of graphite may be formed into cages, nanotubes, nanocoils, nanocones, etc. Uses including artificial photosynthetics, and optically active helical polymers. DNA nanotechnology including knotted DNA molecules are described. Just as the Appendix in "Emergent Computation: Emphasizing Bioinformatics" discussed shape grammar applications of planar (and higher dimensional applications) of DNA, these are also discussed in this exciting paper. Hydrogels are dilute polymer networks capable of encapsulating large volumes of water. Applications include drug delivery and wound healing tissue engineeringm and are currently extensively used in the fabrication of contact lenses. In vivo applications must be cytocompatible but in many cases are in fact cytotoxic at low concentrations. This paper reports the use of a 20-residue photocaged peptide VKVKVKVKVDPPTKVKXKVKV–NH2 with hairpins that is unfolded in aqueous solution under ambient light, but under exposure to UV radiation, results in an uncaged peptide with intramolecular folds. This work has similarities to emergentcomputation.com/quad.html#PHOTO for recent work with quadruplexes. 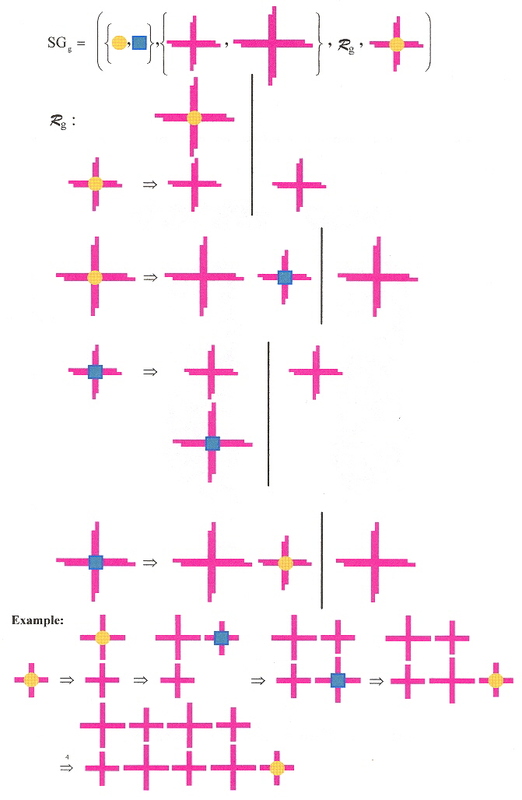 The above cycle results in a contraction between the quadruplex conformation and the linear conformation. A nanomotor is constructed based upon two conformations of DNA: intermolecular duplex (linear) DNA changing to obtain intramolecular tetraplex conformation (ω=TGGTTGGG, thus the tetraplex: ωTGTωR). The motor cycles ten times in 4000 seconds. A porphyrin connector composed of four identical groups "R". "R" has a Watson-Crick complementary tag strand "Tc" to a tag "T" on Tile BT. 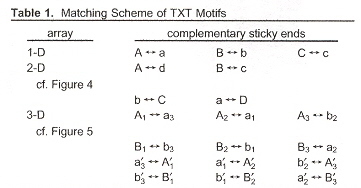 Without the porphyrin connector, tiles A and BT form a two-dimensional DNA array (thus tile BT has four different sticky-end overhangs plus the additional tag T). With the connector present, T and Tc self-assemble into 3-dimensional nanotubes. Tiles A and BT have been construced with Watson-Crick overhanging sticky-ends to induce the observed 2-dimensional self-assembly. Gold nanoparticles conjugated with thiolated DNa bind to DNA A tiles. These A tiles are then mixed with three different kinds of B tiles to obtain NGAB (Nano Gold AB), NGABL (Nano Gold AB Long), and NTAB (Nano gold Track AB) self-assembling structures. 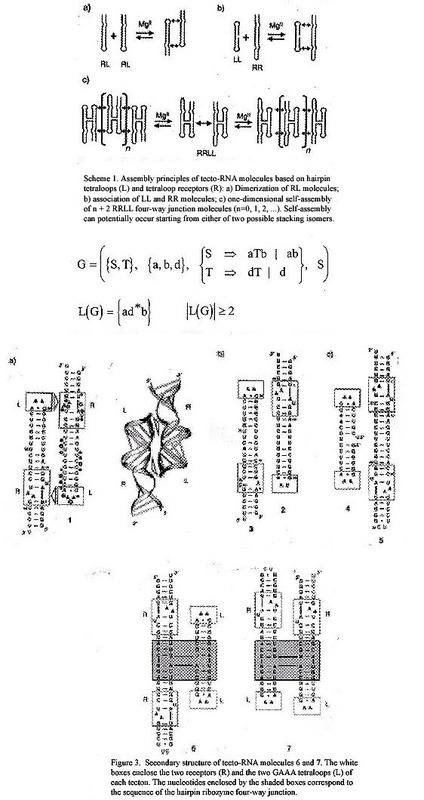 The DNA is in the form of a 2-dimensional Holliday structure (cruciform) as discussed in the appendix in "Emergent Computation: Emphasizing Bioinformatics". Some Holliday-like structures have longer arms (thus the Long structures). Some have only 3 sticky ends (hence the 1-dimensional Track structures). The researchers used novel methods to be able to obtain reliable results. The researchers state that by using variable sized Holliday-like structures, reliable and programmable spacing of gold nanoparticles in 1- and 2-dimensions can be achieved. The researchers note that the cruciform structures are not perfectly square, and that gold nanoparticles sometimes detach from the DNA. The researchers forsee new materils with different kinds of nanoparticles such as the following. A shape grammar very similar to the kind discussed in the appendix of "Emergent Computation: Emphasizing Bioinformatics" can easily be constructed, where two classes of Holliday structures are used, the elements in each class being of different sizes. DNA self-assembly begins with the chemical synthesis of single-stranded DNA that self-assemble into branched DNA known as 'tiles'. 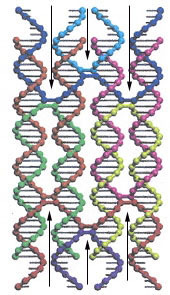 DNA tiles can carry sticky ends that are complementary to the sticky ends of other DNA tiles, thus resulting in the assembly of tiles into DNA lattices. One application of DNA-based self-assembly is the use of self-assembled DNA nanostructures to direct the assembly of other macromolecular components such as proteins. Aptamers are DNA or RNA molecules selected for their ability to bind to other molecules, such as other nucleic acids, proteins, organic compounds, and organisms. This paper reports selective DNA aptamer binding to link proteins to periodic sites of a self-assembled DNA array. Different tiles and lattices with different geometric patterns can be designed. A DNA grammar for such tiles induces a grammar on the induced protein lattice. 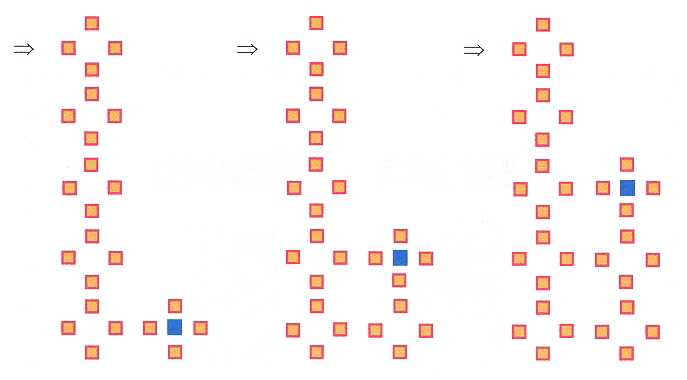 As discussed in the appendix to "Emergent Computation: Emphasizing Bioinformatics", if a shape grammar is used to describe the DNA lattice, the induced grammar for the proteins would also be the corresponding shape grammar for the protein lattice. Using H to represent a hydrophobic amino acid, and P to represent a polar amino acid, then the heptad repeat is of the form (HPPHPPP)n. Two 28-residue peptides have been designed to form a staggered (analogous to "sticky ends) heterodimer used for assembly of "coiled-coil" fibers. SAF abbreviates . 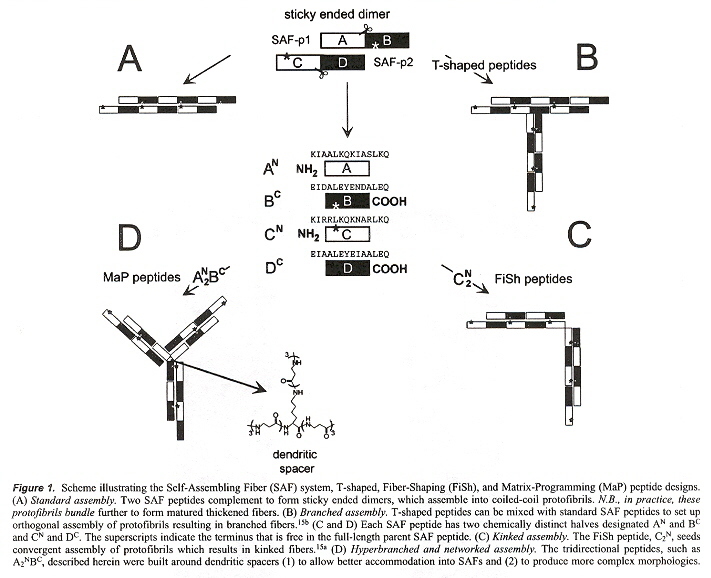 Two SAFs have been designed, SAF-p1 and SAF-p2, meaning two SAFs that are polypeptides and assemble into fibers. Each SAF polypeptide is a heptad of the form abcdefg as follows: isoleucines at a, leucines at d, glutamate at e, lysine at g, asparagine at a in complementary heptads. SAF-p3 designed as a circular permutation of SAF-p1, swapping the last two heptads with the first two heptads. SAF-p1 with SAF-p2 produces a fibre, SAF-p2 with SAF-p3 is a blunt dimer. See the Figure below. "b" looks down from the top (N terminus) towards the bottom (C terminus), abcdefg on the left is circled as 2, as it is SAF-p2, while abcdefg on the right is circled as 1, as it is SAF-p1. The amino acid subscripts refer to the numberings in "a". This paper is very similar to the 2000 paper. Each SAF polypeptide is a heptad of the form abcdefg as follows: Ile at a, Leu at d, Lys at e and g, at the N terminus. Glu for e and g at the C terminus to obtain staggered assembly. Asparagine at a different a site. in complementary heptads. SAF-p1 with SAF-p2a produces a fibre. AN BC couples with CN DC with DC associated with AN (see the figure below). Control of the length of self-assembled tubes. Controlled functionalization of both the interior and exterior surfaces of self-assembled tubes. The hierarchical organization of isolated tubular building blocks organized as hybrid materials. The first peptide sequence forms β–hairpin structures that assemble reversibly, the second peptide sequence assembles irreversibly into extended β–strands that are highly ordered two-dimensional nanostructures. Assembly is controlled by various stimuli such as pH, temperature, and ionic strength, and these stimuli are used to control reversibility. Nanomachines fuelled by compementary ddDNA oligonucleotides often accumulate dsDNA waste products that poison the system, decreasing efficiency, until they rapidly become useless. This paper reports a four-stranded i-motif "quadruplex" that is stable, based upon the following complementary strands. At pH 5.0, X folds into an i-motif structure. At pH 8.0, X unfolds and is hybridized with Y to get a duplex dsDNA. Switching between conformations is rapid, the waste product dsDNA is nontoxic. The paper reports 30 cycles over 5000 seconds controlled only by pH. This paper is a good application of the above paper ("A Proton-Fuelled DNA Nanomachine"). This paper reports upon the integration of i-motif structure nanomachines with a mechanical nanodevice (a cantilever), to show that a nanomachine can actually be assembled to do work. The idea is to attach an array of dsDNA oligonucleotides with an alkanethiol linker to an array of cantilevers. Using pH to control i-motif to dsDNA interconversion, the force exerted due to conformational change bends the cantilever in a specific direction (to do work). The conformtional changes are reversible allowing a cycle of cantilever bending, without poisoning the motor. The authors point out that in contrast to polymers and rotaxanes, these motors operate under mild, aqueous conditions, and selection of oligonucleotide sequences supports control of a tuneable system. 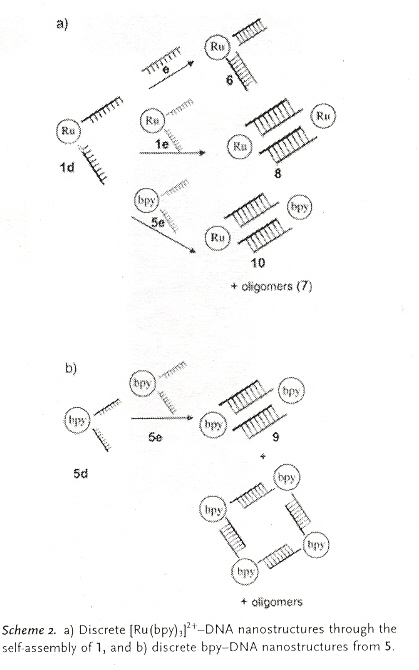 The oligonucleotide sequences reported in this are as follows (the underlined base mismatches in Y are to prevent intramolecular G-quadruplex formation. G-quartets in an intramolecular structure can "pinch" or contract, acting as a nanoswitch. The "pinching" or contracting is easily controlled by modifying cation concentration by using a chelator. The two states of contraction are linear dsDNA vs a DNA G-quartet, as depicted in quad.html#QQQQ2. A number of papers have been published establishing the latest conquests in designing and constructing a variety of nanotechnological objects. Objects such as nanotubes, nanosprings, nanogears, nano-propellers, etc. It would appear that the approach taken is based upon a form of philosophical "reductionism". How long before nano-cars, nano-ships, nano-lawnmowers, etc.? Thus this article discusses the report in Science about a nano-rotory-motora. Not to disparage the hopes that nanotechnology might provide for mankind, but a closer examination of some of the philosophical questions is a worthy effort. The question is asked "Why are some scientists so quick to believe in such direct parallels between macro- and nanomachinery?" Siegel asks "What are the metaphorical infidelities of the classical molecular model, and what is their impact on Fletcher et al. 's molecular rotor and the dream of nanomachines?" "Despite the time-averaged correlated motion of these gears, their motion is essentially Brownian and without the capacity to do work." Siegel points out that over multiple cycles, these motors do work by "using enthalpy to corral entropy, something clearly different from their macroscale counterparts." Thus the macroscale machines do work by using thermal fluctuations, while Brownian machines at the nano-level have rapidly dissipated thermal gradients and losses of energy due to collisions with solvent molecules. The point being the following: "The appeal of direct molecular analogs to macroscopic machines makes paying attention to the distinctions between macro- and nanoscopic mechanisms all the more crucial." 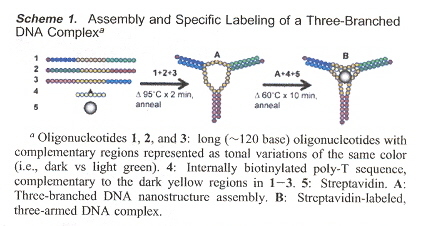 A good review of the general trends in DNA self-assembly of nanostructures. Discussion of the use of synthetic oligonucleotides as well as other molecules such as PNA. Two and three dimensional nanostructures are discussed, using modules composed of multiple building blocks. The living cell is viewed as the most advanced nanostructure based upon self-assembly of different building blocks. Given a choice between DNA, RNA and proteins, proteins are considered the lesser choice due to their higher complexity. 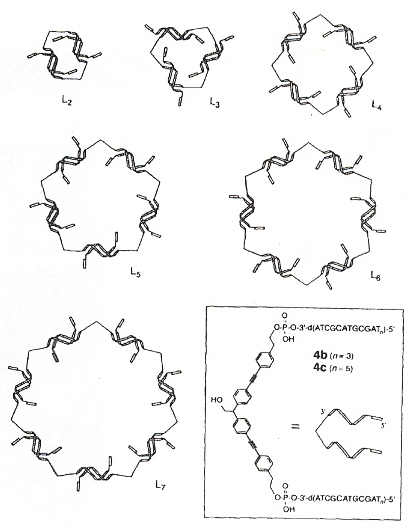 Double-helix tiles are discussed, but triple-helix DNA is also discussed a. Organic self-assembling cyclic scaffolds such as L2, L3, through L7 are discussed b (see the figure, below). Many other experimental results are discussed in this paper.